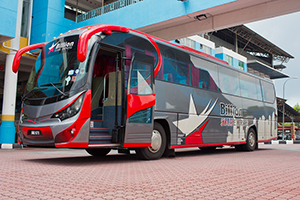 Billion Stars Express is a bus operator positioned in Prangin Mall, Penang. It covers back and forth trips destinations in the East coast of Peninsular Malaysia, Singapore and Hat Yai. They run quality fully air-conditioned coaches with reclining seats, each with spacious legroom between them offering a comfortable travel aboard their bus. These buses are well maintained and comply with the international safety standards, ensuring that passengers remain safe and comfortable throughout their journey until they arrive at their designated destination. Address : Unit G-14 Prangin Mall, Jalan Lim Chew Leong, 10100 Penang.